We have so many tech articles about how to design pcb. However you may still curious how to manufacture boards in our factory as a designer. 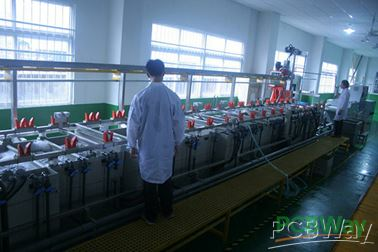 I know you can check the production status in your PCBWay account, it shows the mainly production process, here I will show you more details and you can download the file. ① Confirmation of the whole or its main characteristics of an outsourcing or purchasing material in accordance with the relevant standards of the material or confirm whether it meets the requirements for use. ② Follow up the quality problems found in the inspection process and the major material quality problems found in the production and market feedback, and then establish preventive measures within the IQC. According to customers’ requirements, cut the whole copper clad sheet into small pieces. the input of materials to the final packaging process, which means that IPQC will appear many times throughout the production process. ① Full inspection: A method of inspection in which all products or materials submitted for inspection are inspected without omission. ② Sampling inspection: It is a typical statistical inference to all the individuals of a batch of products for inspection and judge whether the whole batch of products are qualified according to the test results of samples. Burrs are microscopic metal particles that are removed from the surface of the workpiece. These particles are called burrs and are formed during cutting, grinding, milling and other similar chip cutting processes. To improve quality and service life, it is necessary to remove the burrs from all metal precision parts. The traditional deburring process includes machining, grinding, polishing and other processes with different degrees of automation. PTH is customarily called a metallized hole. 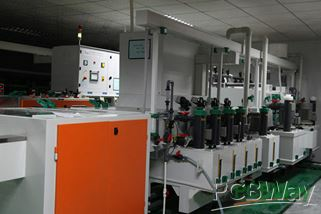 It is to coat the entire hole wall with metal, so that the two sides of the printing plate or multi-layer printing plate inner and outer layers of conductive graphics to achieve electrical connectivity. The hole plating process traditionally uses chemical copper plating to deposit a thin layer of copper on the hole wall, and then electroplating the copper to a specified thickness. Step 7. IPQC(Input Process Quality Control): The same as step 4. This process is the transfer of graphics from one medium to another through image transfer by using the photosensitive materials. 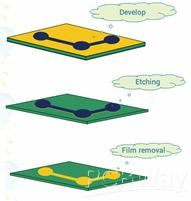 Take the production of inner circuit as an example: a dry film should be pressed on the substrate first and then covered with the film. Next, the illuminated place would be very different from the place not illuminated after exposing. 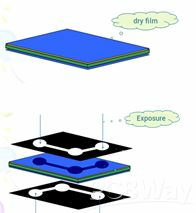 For Photo polymeric dry films, the color of the illuminated area becomes darker, meaning that it has hardened (as a result of photo polymerization), and then developed (using sodium carbonate solution to wash away the unhardened dry film), where the original film is transparent, the dry film is retained, whereas the original film is black and the dry film is not hardened. It has been shown off. The substrate is then etched with a copper etching solution (a chemical that corrodes copper). Without the protection of the dry film, the whole army of copper is covered, and the copper surface under the dry film is retained. If our negatives use colorless transparency to represent lines and copper areas, and black to represent copper-free areas, after exposure, development, etching, the image on the negatives is transferred to the substrate. The overall result is that the circuit diagram in the CAM workstation is transferred to the substrate via Plotter output and then to the substrate through the above process. Image transfer method is widely used in PCB factory, not only in the production line, but also in the production of weld-proof, screen plate and other needs to accurately control graphics occasions have its place. Step 9. IPQC(Input Process Quality Control): The same as step 4 and 7. After a period of electroplating to increase the thickness of the exposed area and the copper inside the through hole, the exposed area (also including the through hole) is coated with a thin layer of tin. At the end of this step, all the remaining photoresist is removed, leaving only a copper-covered panel with only tracks, pads and a thin layer of tin through the hole. At present, the typical process of PCB processing is graphics electroplating, which is to electroplate a layer of lead-tin to resist corrosion on the diagram of the circuit, and then use chemical method to corrode the remaining copper foil, known as etching. ① Preetching: It is the key process to ensure good adhesion of screen printing ink and metal surface, which is necessary to thoroughly remove oil and oxide film on metal etching surface. 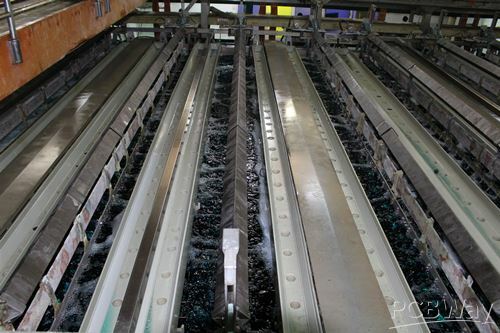 ② Oil Removal: Oil removal should be determined according to the workpiece oil situation. Generally speaking, oil removal should be placed in front of the silkscreen in order to ensure the effect of oil removal. ③ Oxidation Film Removal: Choose the suitable etching solution according to the metal type and film thickness, so as to ensure clean surface. AOI is a testing method based on the principle of optics to detect common defects in welding production, which utilizes high-speed and high-precision visual processing technology to automatically detect various mounting errors and welding defects on PCB boards. The machine automatically scans the PCB through the camera and compares the tested welding spot with the qualified parameters in the database. 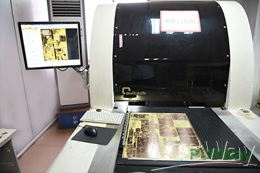 After the analysis and processing of the image, any defects on the PCB would be marked out by the display or automatic mark for maintenance personnel to repair. Solder mask is a thin lacquer-like layer of polymer that is usually applied to the copper traces of a printed circuit board (PCB) for protection against oxidation and to prevent solder bridges from forming between closely spaced solder pads. Solder mask is not always used for hand soldered assemblies, but is essential for mass-produced boards that are soldered automatically using reflow or solder bath techniques, and it is traditionally green but is now available in many colors. Step 14. IPQC(Input Process Quality Control): The same as step 4, 7 and 9. ① Surface Cleaning: Clean the stain on the organic glass surface of the silk screen printing machine with alcohol. ② Fixing Screen Frame: Fix the screen frame to the screen printing machine and tighten it with the fixed knob. ③ Preliminary Positioning: Adjust the position of the PCB to make the position of the holes on the PCB coincide with the positions of the corresponding holes on the silkscreen frame. 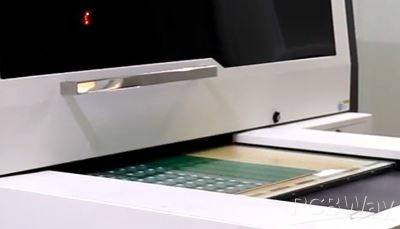 ④ Adjust The Position Slightly: Turn on the counterpoint light source and adjust the position of the PCB by adjusting the X/Y/Z/ɑ direction to make the pattern on the PCB completely coincide with that on the silkscreen frame. ⑤ Scratch Printing Ink: In the area with graphics evenly coated with a layer of silk printing ink, with a scraper in one hand and press the screen frame in the other hand, then scraping in 45 degree by using the scraper. Step 16. 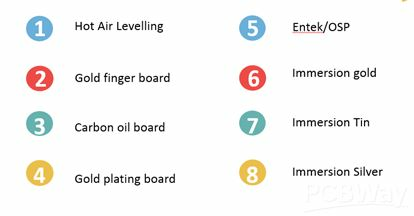 IPQC(Input Process Quality Control): The same as step 4, 7, 9 and 14. Surface finish, also known as surface texture or surface topography, is the nature of a surface as defined by the three characteristics of lay, surface roughness, and waviness. 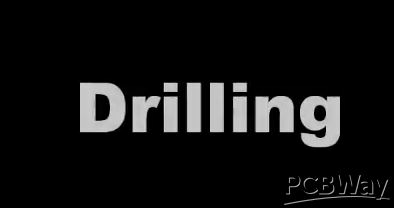 This process may be grinding (abrasive cutting), polishing, lapping, abrasive blasting, honing, electrical discharge machining (EDM), milling, lithography, industrial etching/chemical milling, laser texturing, or other processes. Step 18. IPQC(Input Process Quality Control): The same as step 4, 7, 9 and 14. Step 20. 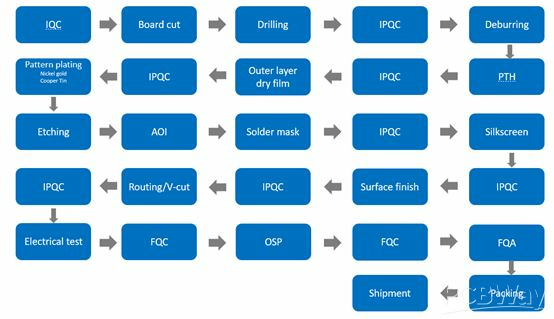 IPQC(Input Process Quality Control): The same as step 4, 7, 9,14 and 18. At the end of the PCB production process we electrically test every multilayer PCB against the original board data. Used for checking the integrity of the tracks and the through hole interconnections – checking to ensure there are no open circuits or no short circuits on the finished board. There are two test methods, flying probe for smaller volumes and fixture based for volumes. We electrically test every multilayer PCB against the original board data. Using a flying probe tester we check each net to ensure that it is complete (no open circuits) and does not short to any other net. In the last step of the process a team of sharp-eyed inspectors give each PCB a final careful check-over. Visual checking the PCB against acceptance criteria and using PCBWay “approved” inspectors. Using manual visual inspection and AVI – compares PCB to gerber and has a faster checking speed that human eyes, but still requires human verification. All orders are also subjected to a full inspection including dimensional, solderability, etc. OSP is a method for coating of printed circuit boards, which uses a water-based organic compound that Design inflow to final product delivery and warehousing. 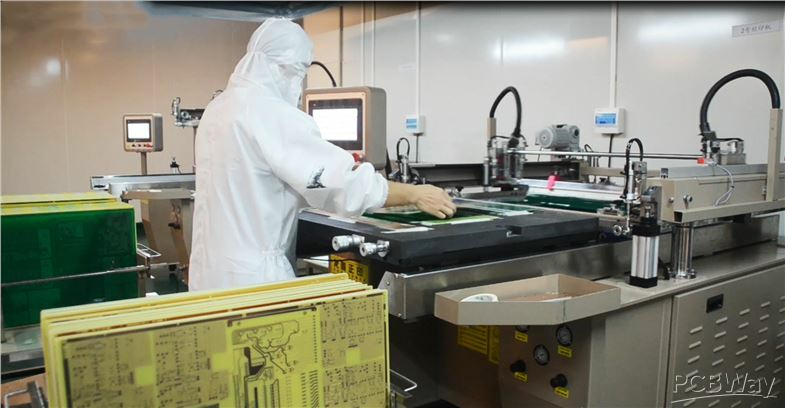 Boards are wrapped using materials that comply with the PCBWay Packaging demands (ESD etcetera) and then boxed prior to be being shipped using the requested mode of transport. PCBWay.com offers flexible shipping methods for our customers, you can choose any one of the methods, such as FedEx, DHL, EMS, UPS, TNT, Hongkong Post and so on. Youtube: How PCB is manufactured? 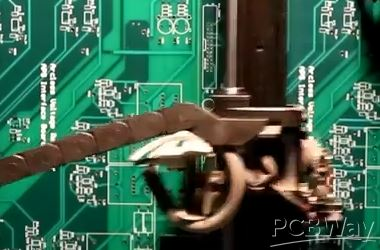 Note：This flow is based on the most common pcb manufacturing process. Sometimes the manufacturing process will be adjusted accordingly to your pcb design requirement.